7 years ago today we welcomed our itty bitty little Ladybug into the world. She was born at 03:56 and in true Ladybug fashion – made a very grand entrance after a very long labour. Knowing her now I wouldn’t expect anything less as she LOVES being the centre of attention, just as every princess should. At the time we didn’t have a diagnosis, and were told that the chances of her surviving the first year were beyond low. None of that mattered. We had our sweet tenacious baby girl and our life, although atypical for many new parents, was perfect. Today we celebrate Ladybugs 7th birthday. In the past 7 years she has taught me patience, strength, courage, and perseverance. Everyday brings forth a new struggle, but everyday she takes those challenges and kicks a**! She is doing amazing in school, and has even started to take steps in her gait trainer. Ladybug adores her little brothers, and often smiles and laughs when they play together. Last week I came across an amazing video called The Brain that Changed. It shares the story of a man in Australia who has Cerebral Palsy. His family pushed the known boundaries and explored Neuroplasticity. Andy’s nervous system was still “plastic” enough that he was able to change and do many things in adulthood that he’s never been able to do before. It is incredible to watch his transformation, and the story reignites hope that Ladybug can too achieve the unimaginable. Then just yesterday I was sent another video. It is the most recent ad campaign for SickKids Hospital in Toronto, Ontario. It is raw, powerful, fierce and inspiring. Yes, it might be hard to watch and is definitely not your typical soft music fluffy bunny children’s hospital campaign – but, it gets the point across loud and clear. It’s time to fight even harder and conquer. I feel like the universe is trying to send me all these messages lately about Ladybug. We have put a lot of her therapies on hold these past couple years as they are extremely expensive. I’ve always known that deep inside there is a little girl waiting to break free, we just need to find the right therapies and tools that can help Ladybug. It’s time to regroup, take a fresh look at our budget and maybe even plan a fundraiser. Between my tenacity and Ladybugs resilience we WILL move mountains. In Honour of Rare Disease Day – Help Me Get CDG Recognized as an Official Day. Today, February 29th 2016 marks the 9th International Rare Disease Day. 5 years ago I published this blog post dedicated to Rare Disease Day. When my daughter was first diagnosed with Congenital Disorders of Glycosylation, there wasn’t a lot of information or even support for families like myself. 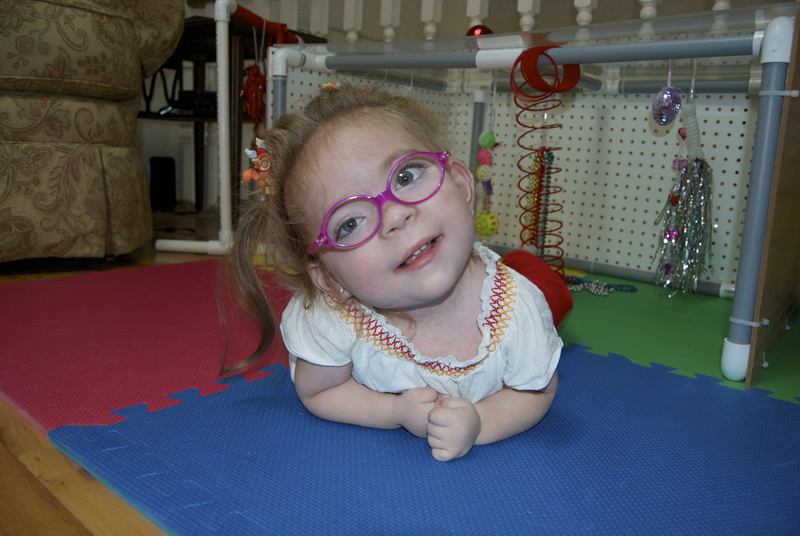 At the the time of her diagnosis she was the only girl in the entire world known to have her subtype. Now, thanks to the wonders of science and social media, I have been in touch with a family in the USA who has a beautiful little girl with the same subtype as my little Ladybug. Through the dedication and hard work of my CDG family, there are now CDG conferences both in North America and Europe and several Facebook groups that have become an amazing means of support for so many. I couldn’t think of a better day to announce that the CDG families are working towards making May 16th World Congenital Disorders of Glycosylation (CDG) Awareness Day! Please sign our petition to The World Health Organization (WHO) here. I also encourage you to share this blog post with all of your friends and family. You can easily share via Twitter, Facebook or email with the buttons at the bottom of this page. The more signatures we get the faster we can make this dream a reality. I started writing this post shortly after Christmas this past year. It is a very difficult thing to talk about especially because it is so close to home. I originally wanted to title it 11 days, because in 11 days one family’s life changed forever. I’ve decided to broaden things a bit as I’m hoping this post will educate others about how dangerous a simple virus whether it be a cold, flu or GI bug can be to a medically fragile child. 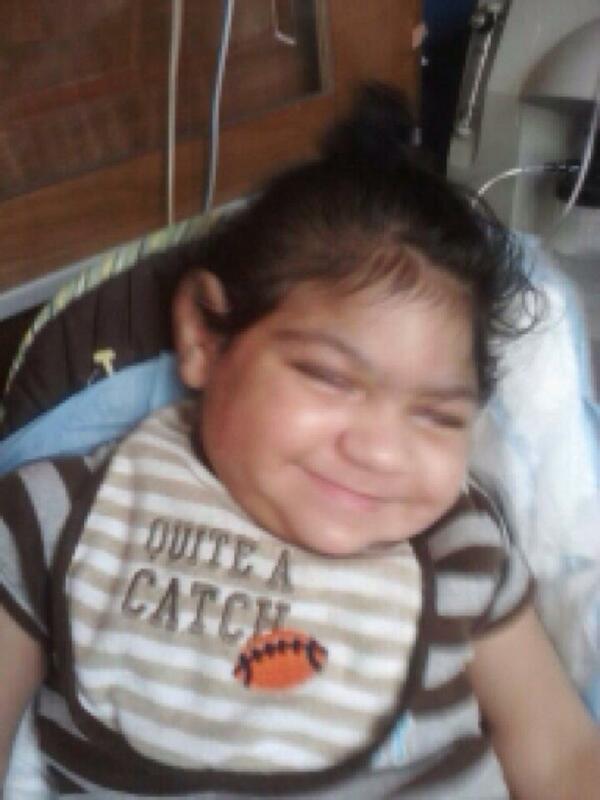 This past December a brave little man from our CDG family was admitted to the hospital. For our kids this is a common occurrence, especially around the cold and flu season. This little superhero was otherwise stable in the weeks previous to this admission. He was probably in contact with someone who had a bad cold or some other type of virus that his body couldn’t fight off. Whatever disease a medically fragile child might be fighting chances are their immune systems are extremely low to non-existent. This is the case with my little Ladybug and other children with Congenital Disorders of Glycosylation. After a few days in the hospital pneumonia set in. The entire CDG family was pulling for a speedy recovery for this little guy even though we knew it would be a struggle. He had overcome so much previously, everyone knew he was a fighter. Around 9 or so days after admission his mother was told that he now had ARDS. Acute Respiratory Distress Syndrome is the sudden failure of the respiratory (breathing) system. It causes a build up of fluid in the lungs and when there is fluid in the lungs it means less oxygen is able to reach the blood stream. This in turn will deprive your organs the oxygen they need to function. Despite everything no one lost hope – our kids are fighters. Day 11, December 24, 2013. Christmas Eve. This amazing, strong, adorable, little 5-year-old CDG superhero gained his angel wings. This was devastating on so many levels for me. First, our CDG family is very close and although many of us have never met in person we still love each and every single child with CDG as if they were our own. Second, because this happened in as little as 11 days to a child with the same disorder my 4-year-old daughter has. I’ve said it before and I’ll mention it again. I don’t want to keep my little Ladybug in a bubble. I know that when she goes to school, the grocery store, birthday parties etc. that she is always at risk for catching something. This is a risk I’m willing to take to give her the best “normal” life she can possibly have. I do however feel very, very strongly about others knowingly exposing my child or any other medically fragile child to any kind of sickness. If you have had a cough and sound like a barking seal, runny nose with green slime, fever, diarrhea or vomiting within the past 24-48 hrs please, I beg you, stay home! That plate at Easter dinner can be set aside and dropped off, your child will eventually get over not going to the birthday party because they have a really bad cough. It’s this kind of selfishness of people that absolutely boils my blood. My hope was and is, that this post will help in some way open people’s eyes as to how dangerous viruses can be not only my sweet little Ladybug but to every child with a low immune system. In loving memory of Brady and all of the beautiful CDG angels. I have been quite lapse in my blog postings these past few months…time just seems to fly by. On December 3rd my sweet little Ladybug celebrated her 4th birthday. It was a quiet family celebration as there were so many illnesses going around we didn’t want to risk her getting sick. Ladybug has completed her first term of preschool. She absolutely loves going, and her classmates all adore her. I was amazed to see how fast the kids all took to Ladybug. She is certainly not short of friends. September to November was a little rough, as Ladybug would go to school for 2 mornings then be off sick for 2 weeks. By the time the end of December rolled around she managed to stay healthy 3 weeks in a row. Huge milestone as her immune system is slowly building. We’re in the midst of getting a communication device ordered. It’s basically a first step to enabling my princess to communicate the way I know she can. The “switch” is like a large button that we can record words or phrases on. If we wanted to sing Old McDonald had a Farm I could record E-I-E-I-O on the switch and when it came time for that part I would give Ladybug a verbal cue that it was her turn. It will look similar to the one in this picture. We’ve been able to test one out and Ladybug responded so well, we knew it was our first step on her communication journey. She actually responded close to 100% better on music related prompts than ones with toys or games. I guess my musical genes have been passed on to my little Ladybug – time to get that baby grand piano I’ve always dreamed of. There is so much more to catch everyone up on, however, I’ll do it bit by bit rather than inundate everyone in one post. I will end this by giving a little teaser and saying that you will definitely want to keep an eye out for my future posts, as there are so many exciting updates to come! Look Mommy, I Did It! At 3 months a typical child will begin to roll over from front to back and lift head when on tummy. Around 5 months this child will probably be able to lift his head, push up on his arms, and arch his back to lift his chest off the ground and roll both ways . Some might be able to do this ahead of schedule, others will lag a few months. As everyone knows Ladybug is certainly not your typical child. When other kids her age were putting everything imaginable in their mouths and tasting all kinds of new foods, Ladybug was discovering how to pull out the feeding tube in her nose. While these same kids were taking their first step Ladybug was glowing in the dark from all the tests that were performed to find the cause of a GI bleed. This has been, and will most likely continue to be a hard pill to swallow – but as the years have passed I have learned to celebrate, cherish, and capture each and every milestone. I’ve always been and always will be one who takes a lot of pictures and videos. The way I see it, you will only regret the pictures you never took. When Ladybug discovered her G-Tube and was swinging it back and forth in her hand my first instinct was not to remove it from her hand but to grab the camera. There are so many unknowns with CDG that I will not pass up any opportunity to capture a single moment in Ladybugs life. 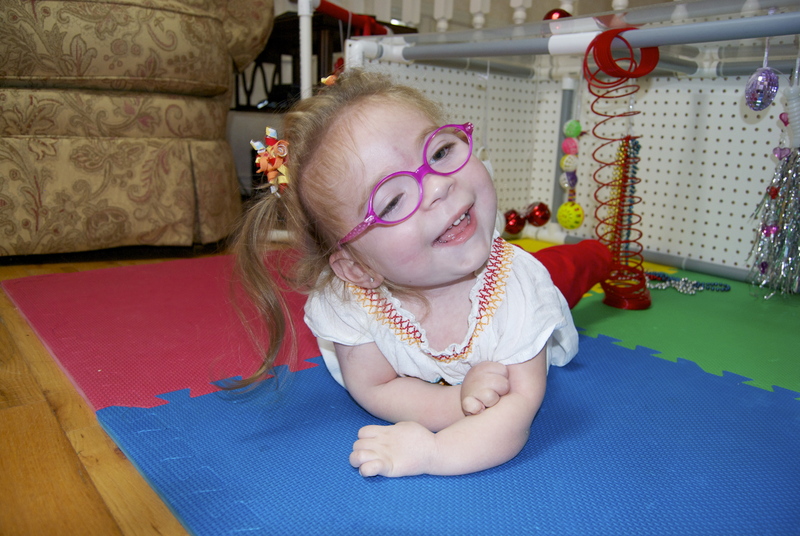 This past weekend Ladybug was playing in her Little Sensory Room and kicking up a storm. The bells were jingling non stop, then it got quiet for a few seconds. This didn’t surprise me, usually Ladybug takes mini rests in between all the craziness the Little Sensory Room creates. A minute or so later, all I heard was non-stop laughing. I looked around the corner to find Ladybug completely out of her Little Sensory Room. She had rolled out onto her tummy, hands under her chest and had managed to push her head up all by herself. Insert fireworks, loud cheering, maybe a marching band playing We are the Champions, and one unbelievably ecstatic mama here. It may have taken my sweet Ladybug 3 years and 10 months to achieve this, but the look of accomplishment on her face when she lifted up her own head screamed “Look Mommy, I did it”. That in and of itself, was worth every single day, month, and year of waiting for this huge milestone to occur.